LODE -- Aprender En Libertad -- PSOE. The sticker shows the tips of five color pencils coming up from the bottom up in the colors (left to right): purple, pink, blue, yellow and white. On the bottom right hand corner there is the logo for the Partido Socialista Obrero Español (PSOE), which is a sideways fist holding a red flower. The message within the sticker is advocating for the right to education. 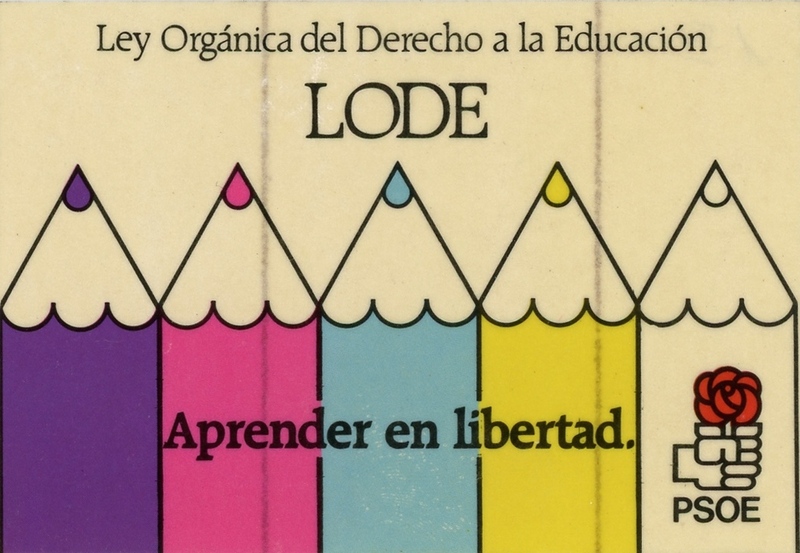 It makes references to LODE (the Organized Law For The Right Of Education), which was implemented in 1985, the next big piece of legislature since the General Educational Law of 1970. The LODE "affirmed the right and educational opportunity of all Spaniards and it also provided for a greater role for "society" in the educational system. In addition, it provided for economic funding for both public and private educational centers."